During our time on Kauai, we spent a fair amount of time with things planned to do and lots of activities lined up. However, it was a vacation so having a bit of time to gently amble about the place and look at the pretty stuff was still part of the schedule. One day we took a trip to the south side of the island to see what was down there. This side of the island is more heavily developed for tourism but it did have some cool stuff to see. One such feature is Spouting Horn. This is a hole through the rock that funnels incoming waves and forces them out of a blowhole. Depending on the tide and the strength of the waves, this can produce a waterspout of over 50 feet. Apparently, there used to be more than one spout with the other one producing a far larger plume. However, this sprayed salt water onto a small part of the local plantation and reduced the crop yield so the plantation owner had explosives dropped in the hole and now it doesn’t do much at all. 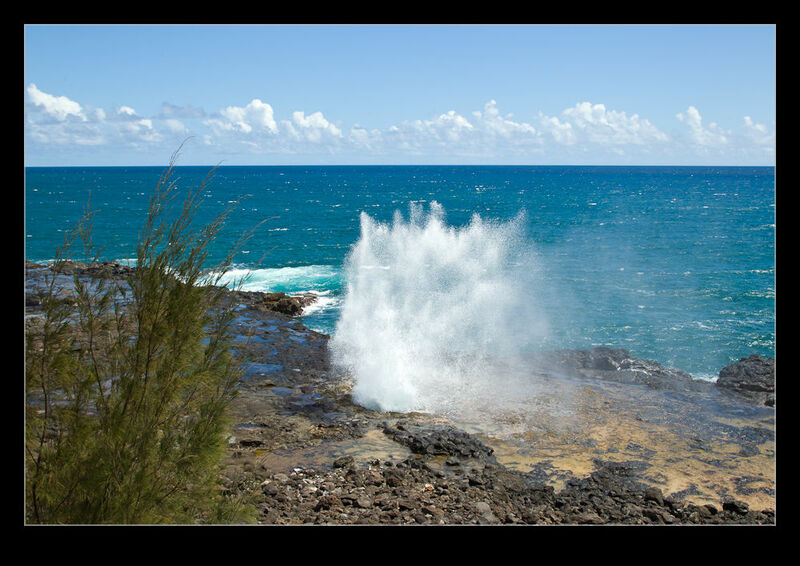 There is another hole nearby that produces a sighing sound as the waves come in. You can read the local legends while you are there about the creature trapped under the rock and why it is unhappy. While I suspect this isn’t entirely true, it certainly does make quite a groaning sound as the water comes in which adds to the overall effect. 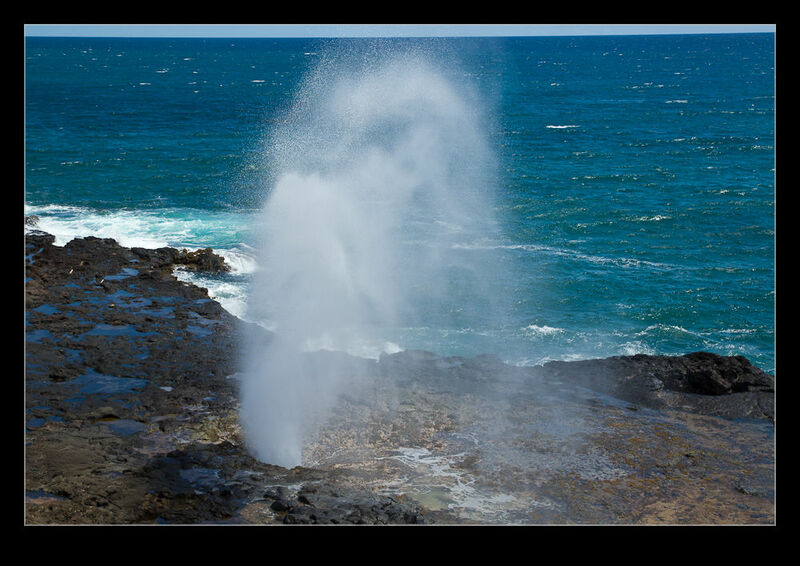 There is a plateau of rock in this area around the blowholes and they are certainly not keen on you going out there. The books are full of stories of people getting swept off by a higher than average wave or even getting swept into the blowholes themselves. Knowing had unpredictable the see can be, I don’t doubt this can and has happened. I am not so desperate to be close that I am going to try out getting closer. It all looked pretty good from the viewing platform. However, one chap was out there while we were there taking a look around. I hope he found it enjoyable. I think he lived. 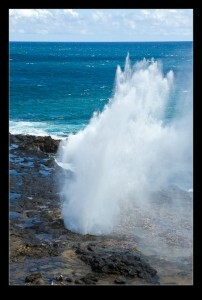 This entry was posted in photo, Travel and tagged Coast, Hawaii, horn, Kauai, photo, spouting, waves. Bookmark the permalink.